Israeli settlers took over a Palestinian home in the Muslim quarter of Jerusalem’s Old City today, evicting about 45 members of an extended family which has occupied the building for more than 70 years. The settlers claimed to have documentation to prove they had purchased the building from the owners. The Palestinian tenants, who have been fighting attempts to evict them for many years, were challenging the takeover in court. 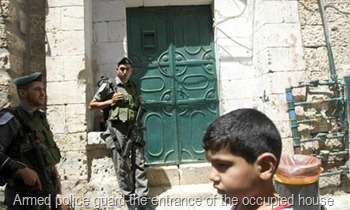 A police spokesman said the Israelis had entered the home "based on documents claiming that they owned the property". According to Mohammed Kirresh, 22, a member of the Palestinian family, "Jewish people and Israeli soldiers with weapons" came at 2am, when most of the family was at a wedding. He said the family, which had rented the property since 1936, had won two previous court cases challenging eviction orders. He claimed the Israelis had broken furniture and damaged belongings. "Everything we own is inside – our money, ID papers, clothes, food," he said. Armed police were guarding the entrance to the house. Around 20 members of the Kirresh family pledged to stay on the narrow street outside the house. "We are staying here," said Mohammed Kirresh. "We hope the court will rule in our favour." Ousama Hamdan is the top Hamas leader in Lebanon and a member of the Hamas politburo. (Manuela Paraipan is an independent foreign policy analyst. This interview was first published in “openDemocracy” on 24 May 2010 under a Creative Commons license). Manuela Paraipan: How do you see European engagement in the area and what do you think are the main challenges for the international community in dealing with the region? Ousama Hamdan: Most of the time, Europeans support American policies, although I believe they understand the region better than the Americans. And that is important. If you want to deal with the region you have to understand it. There is a difference between dealing with the facts as they are and dealing with them as you might wish them to be — or, to put it from a political perspective, attempting to divide the region before dealing with it. That can only create more problems, including breakdowns in communication. Some look to the Arab ‘moderate countries’. . . . I don’t believe in ‘moderate’ or ‘hardline stances’ in politics. Every nation is out for its own benefits. What is moderate for me is hardline for others. And vice versa. The issue is, how to deal with other people? If you want to control them — that instigates new problems. Now, if you want to deal with them in order to create stability in the region, then you have to treat them as part of the region, and understand what they need and what they want. This is one of the major challenges that the peace process faces. Until now, no one has asked the Palestinians what they want. Throughout its period as negotiators, the PLO accepted the conditions laid down, and faithfully implemented what was dictated to them by the international community — in fact mainly the United States, especially after the demise of the USSR. But what happened? Nothing. They found themselves confronted by more problems than ever before. Israeli planes have carried out 13 air strikes on the Hamas-ruled Gaza Strip, Palestinian sources have told the BBC. Four of the strikes took place near the town of Khan Younis, where two Israeli soldiers were killed in clashes with Palestinian fighters last week. The Israeli military has told the BBC the operation was targeting four weapons factories. The strikes are the most serious for more than a year, says the BBC’s Jon Donnison from Jerusalem. The director of ambulance and emergency in the Palestinian Ministry of Health, Dr Muawiya Hassanein, said that three children including an infant were slightly injured by flying debris. Witnesses and Hamas officials said the Israeli raids targeted metal workshops, farms, a milk factory and small sites belonging to the military wing of Hamas. "Israel will not tolerate terroristic activity inside Gaza that threatens Israeli citizens," the Israeli military said in a statement released to the BBC. Palestinian news agencies reported that Israeli aircraft dropped leaflets over parts of Gaza on Thursday warning residents of retaliation for last Friday’s killings of the soldiers in Khan Younis. They were the first Israeli soldiers to be killed in hostile fire in Gaza in over a year. The military wing of Hamas claim responsibility for those attacks. Hamas said police stations and training facilities were among the targets of Israel’s overnight raids. Tensions in the region are running high after a recent Israeli government announcement of plans to build 1,600 new homes for Jewish people in East Jerusalem, which the Palestinians want as a capital of a future state. Militants in the Gaza Strip have recently stepped up rocket fire directed at Israel. On Wednesday, they fired a rocket into an empty field in southern Israel, but there were no reports of casualties or damage, military sources said. The Israeli prime minister says his policy on Jerusalem will not change – a sign that a row with the US over settlement building remains unresolved. Benjamin Netanyahu’s statement came as he was due to brief cabinet colleagues on talks with President Barack Obama. The US says some progress was made. The row is over Israeli plans to build 1,600 homes in East Jerusalem, where the Palestinians want their capital. After the announcement they pulled out of planned US-mediated peace talks. Israel insists the Jerusalem will remain its undivided capital. Nearly half a million Jews live in more than 100 settlements built since Israel’s 1967 occupation of the West Bank and East Jerusalem. They are considered illegal under international law, although Israel disputes this. The row over Israel’s plans for homes in East Jerusalem has caused one of the worst crises in US-Israeli ties for decades. Israel unveiled the plans to build in the East Jerusalem settlement of Ramat Shlomo during a visit by US Vice-President Joe Biden – a move which Washington initially branded an insult. Hours before Mr Netanyahu’s meeting with Mr Obama on Tuesday, it emerged that the Jerusalem municipal government had approved another development in occupied East Jerusalem. The White House has been trying to persuade Mr Netanyahu to commit to several trust-building measures to revive hopes for indirect "proximity talks" between Israel and the Palestinians. Declaring "Jerusalem is not a settlement," Israeli Prime Minister Benjamin Netanyahu struck a defiant note on Monday after new US criticism of Jewish home construction in disputed territory in and around the city. 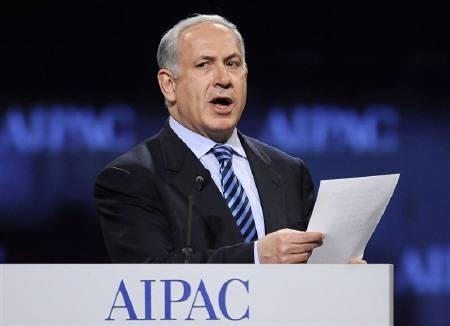 His speech in Washington to the American Israel Public Affairs Committee, or AIPAC, an influential pro-Israel lobby group, contrasted sharply with an address Secretary of State Hillary Clinton made at the same forum hours earlier. Clinton, who followed up her speech with low-profile talks with Netanyahu, said Israeli settlement policy in East Jerusalem and the West Bank endangered peace talks with the Palestinians, an argument the prime minister dismissed. "The Jewish people were building Jerusalem 3,000 years ago and the Jewish people are building Jerusalem today. Jerusalem is not a settlement. It’s our capital," Netanyahu said. Palestinians want East Jerusalem, which Israel captured along with the West Bank in a 1967 war, as the capital of a future state. The United States and Israel have clashed since Netanyahu’s coalition government announced plans this month to build 1,600 homes for Jews near East Jerusalem. Netanyahu began a three-day visit to Washington on Monday, hoping to repair relations with President Barack Obama, whom he meets at the White House on Tuesday. Announcement of the housing project coincided with a visit by US Vice President Joe Biden — Netanyahu said he was blindsided by bureaucrats — and prompted Palestinian President Mahmoud Abbas to delay the start of indirect, US-mediated peace talks. Pointing to what he has described as a national consensus in Israel over its claim to all of Jerusalem, Netanyahu told AIPAC that all Israeli governments had carried out construction in what he termed the city’s "Jewish neighborhoods" since 1967. 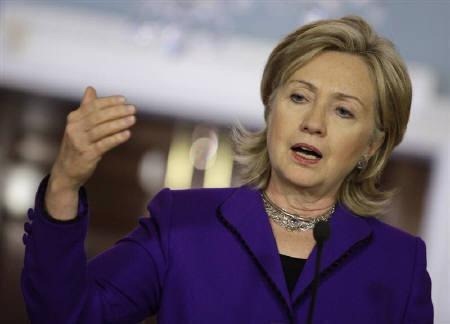 US Secretary of State Hillary Clinton said on Monday that Israel faces "difficult but necessary choices" on Mideast peace and pledged to push for biting sanctions on Iran over its nuclear program. Clinton, speaking to the influential pro-Israel AIPAC lobby group after a turbulent stretch in US-Israel relations, said the Obama administration had a "rock solid" commitment to Israel’s peace and security. But she singled out Israel’s policy of expanding Jewish settlements in East Jerusalem and the West Bank as an obstacle to progress which could imperil US efforts to bring Israel and the Palestinians back to the negotiating table. "New construction in East Jerusalem or the West Bank undermines mutual trust and endangers the proximity talks that are the first step toward the full negotiations that both sides want and need," Clinton said. "It exposes daylight between Israel and the United States that others in the region could hope to exploit. And it undermines America’s unique ability to play a role — an essential role, I might add — in the peace process." The issue of Jewish settlements has soured US ties with its closest Mideast ally as Israel approved new construction in East Jerusalem during a visit by US Vice President Joe Biden, spurring Palestinians to say they would pull out of the indirect talks that Washington only just managed to launch. Clinton is due to meet visiting Israeli Prime Minister Benjamin Netanyahu later on Monday and US Mideast peace envoy George Mitchell is in the region seeking to get the talks back on track. Netanyahu, who arrived in Washington earlier on Monday, has proposed a set of confidence-building measures following the settlement fracas, but said on Sunday Israel would not give up its right to build Jewish settlements around Jerusalem. The UN chief has said Israel’s blockade of Gaza is causing "unacceptable suffering," during a Middle East visit to reinvigorate the peace process. Ban Ki-moon told Gazans that "we stand with you" as he visited an area damaged by Israel’s offensive 14 months ago. His visit to the region comes amid tension over Israel’s plans to build more settlements in East Jerusalem. Rebuilding is difficult due to a lack of building materials during the three-year blockade. Israel imposed a tightened blockade after the Islamist Hamas movement seized power in June 2007. Speaking in Gaza, Mr Ban said families were living under "unacceptable, unsustainable conditions". Mr Ban said it was "distressing" for him to see damage to housing remaining, with no reconstruction possible under the blockade. The blockade has prevented the UN from completing housing projects, but Mr Ban pledged to continue providing aid to Gazans. "My message to people of Gaza is this: the United Nations will stand with you through this ordeal," he said.